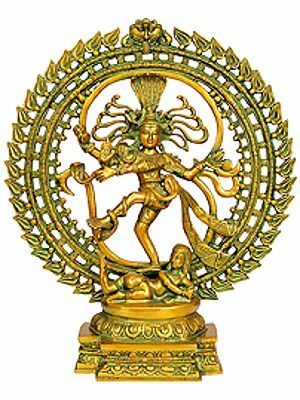 This fine artwork represents a stark, minimally adorned, image of Lord Shiva in the form of Nataraja, the king of dancers. A semi-wrathful face, sharp features, a slender figure and a highly communicative body-language mark Shiva's image here. It is endowed with a workmanship which is magnificent by any parameters. From 'Mahambujapitha', the pedestal consisting of double lotuses, there rises 'tiruvashi', the fire-arch and the great Lord reveals himself from it. The fire-arch rises from the lotus-base, which symbolises manifestation. The arch is the nature, the cosmos manifest, and the great Lord, by dancing, pervades it. Shiva's snake is as much active. It represents the earth. The lotuses, representing ocean, form the base for the entire phenomenon. This gives the great dance further cosmic dimensions and magnitude. 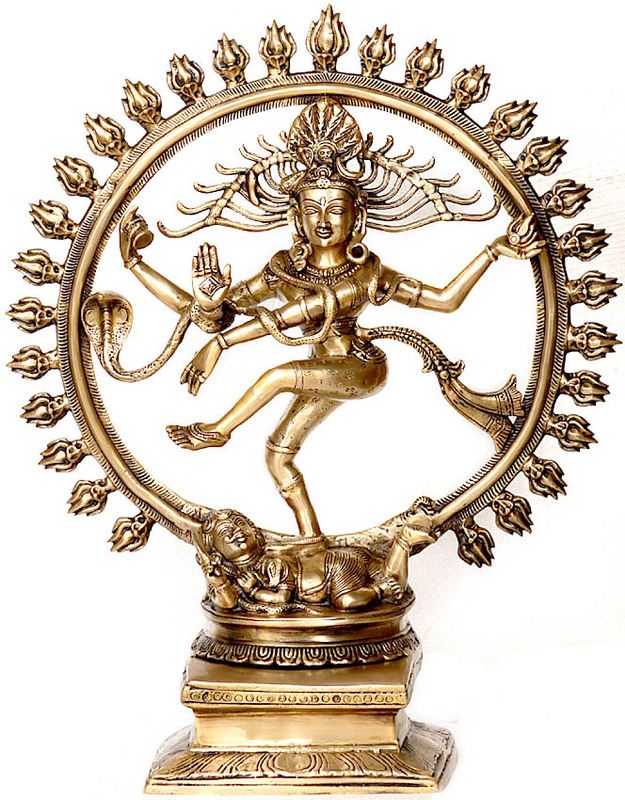 Shiva as Nataraja performs 'Anandatandava', the dance of absolute bliss, after the Great Age has ended and dissolution becomes imperative for it is only him who may and remains to dance over the head of dissolution. Shiva dances over the body of Apasmarapurusha, the demon of forgetfulness. Apasmara is darkness and darkness succeeds dissolution. Apasmara supports the Dancing god's right leg upon its back and looks at him with satisfaction for the demon knows it will prevail even thereafter. In his uppermost right hand the Great Lord holds his 'drum', the symbol of sound, which vibrates the space, or the 'Akasha'. Sound is the first of the five elements that announce creation. His upper left hand carries in it the flame of fire, the symbol of final conflagration, as all that stands created is heading to a dissolution. The lower right hands assures fearlessness as that which is heading towards dissolution will be created again. The lower left hand moves from left to right symbolising release and liberation. There emit from his mind massive fire waves for it is not only his 'Anandatandava' that is fiery but also his object. The 'Anandatandava' takes place in the hall of consciousness within the heart of man. It is the manifestation of fivefold activity - creating, maintaining, unveiling, veiling and destroying. It is a celestial revelation of six 'bhavas', the 'shrishti', 'sanhara', 'vidya', 'avidya', 'gati' and 'agati', that is, creation, dissolution, knowledge, ignorance, motion and inertness. The 'Anandatandava', thus encompasses within it the entire cosmos and its phenomenal existence.